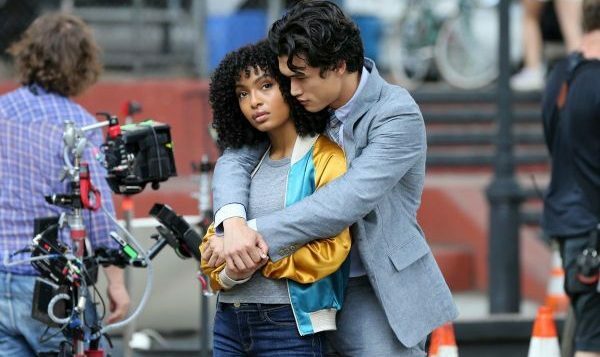 Separately, Yara Shahidi and Charles Melton are very different people. She’s the brains, hitting the books at Harvard and hobnobbing with Michelle Obama. He’s all heart, the real-life sensitive guy behind TV’s favorite jock. But together, the magnetic leads of The Sun Is Also a Star are pure chemistry—and Young Hollywood’s new king and queen. Charles Melton believes in love at first sight. The 28-year-old actor, whose hair/body/face look like they were generated from a Create-a-2019-Heartthrob machine, is telling me how he knows the concept is real: It’s happened to him many times. When I ask Yara Shahidi, who costars with Charles in the upcoming YA-adapted movie The Sun Is Also a Star, what she thinks about love at first sight, she takes her own distinctly analytical approach. Sitting in a makeup chair getting ready for the shoot, the polished activist and Grown-ish star reasons that yes, it must be possible, because her parents are proof. She flashes a smile at her mom, Keri, who’s hanging out on-set and who’s been married to Yara’s dad for 20 years. These two perspectives—Charles might as well have cartoon Cupids floating above his head, while Yara is always prepped to give a well-researched theory on any subject—perfectly sum up these rising stars. He enters a room heart-first; she thinks about what she’s going to say when she gets there. The question is: How much of Yara and Charles’s images are crafted as marketable caricature, and how much is the real deal? First things first: They did not fall in love at first sight. They met on the movie’s “chemistry read,” which is industry-speak for: Do these two potential romantic leads vibe together? (One producer described watching Rachel McAdams’ and Ryan Gosling’s chemistry read for The Notebook as “pure magic.”) And for a fast-moving rom-dram with some seriously gushy scenes, a high-stakes joint audition could have been awkward for Yara and Charles or even detrimental to their careers. Good thing they had a trick up their sleeves. “We shared a Pop-Tart,” Charles tells me, ­referring to a homemade version Yara had brought with her. “‘Share,’ that’s a generous way to put it,” Yara responds, laughing. But the bonding was real: “Dessert is something I’m very serious about,” Yara explains, “so if I’ve shared dessert with you? It’s another level of connection.” She may be joking, but I get the feeling they just naturally clicked.